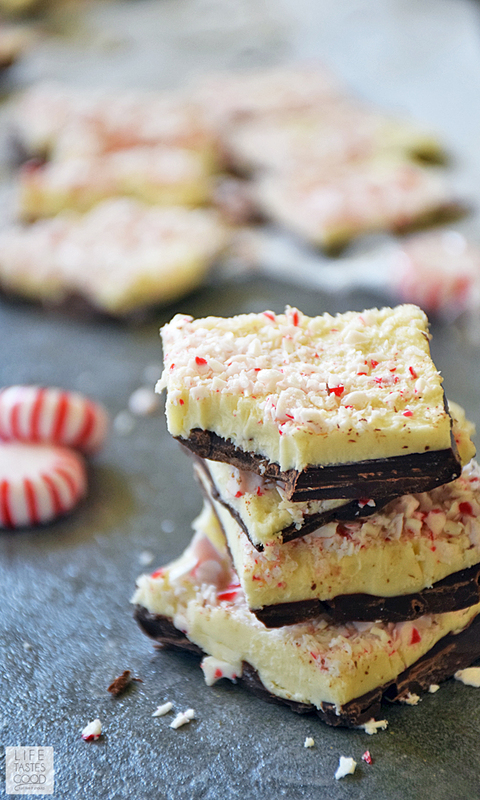 Peppermint Bark Candy makes a wonderful food gift for holiday gift giving. With just 3 ingredients, it is an incredibly easy recipe to make, as well as being festive and pretty. Everyone will love receiving this thoughtful gift from your kitchen! 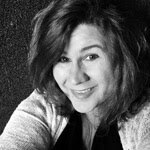 The #SundaySupper Tastemakers are recovering from our Thanksgiving food coma but, with Christmas right around the corner, there is no time to waste! We got right back in the kitchen to prepare for the next big holiday. This week we are sharing our favorite Homemade Holiday Food Gifts, because gifts from the kitchen are made with love and who doesn't like to receive a tasty treat? When our daughter was home, we used to love getting in the kitchen and making gifts for our family and friends. 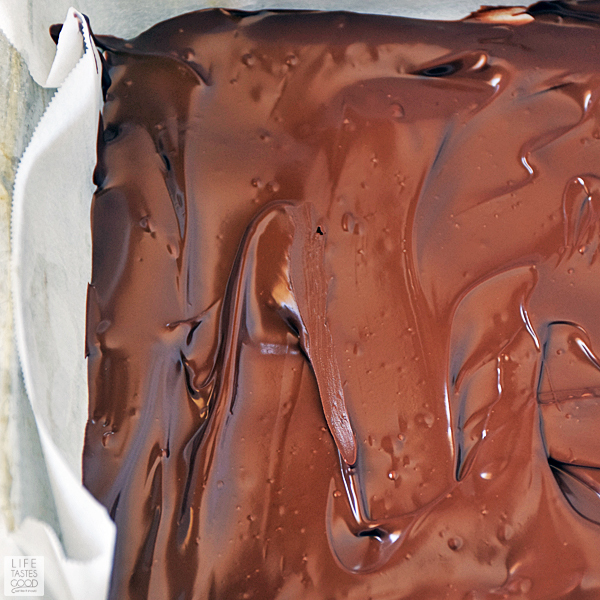 One of the easiest things to make is a chocolate bark recipe. Bark recipes come in just about any flavor you can imagine, they are delicious, and fun to make too. The kids love to crunch up the candy topping, and melting chocolate is a good lesson in patience. Although it doesn't take long to melt chocolate (just ask anyone who's tried to buy chocolate during a FL summer and get it home before it turns into soup), if you heat chocolate too much too fast it will end up in a big hard ball that won't melt no matter what extreme measures you take! Be sure to read the label on the chocolate you buy. It's important to buy both the semi-sweet and white chocolate made with cocoa butter to ensure the layers stay together. 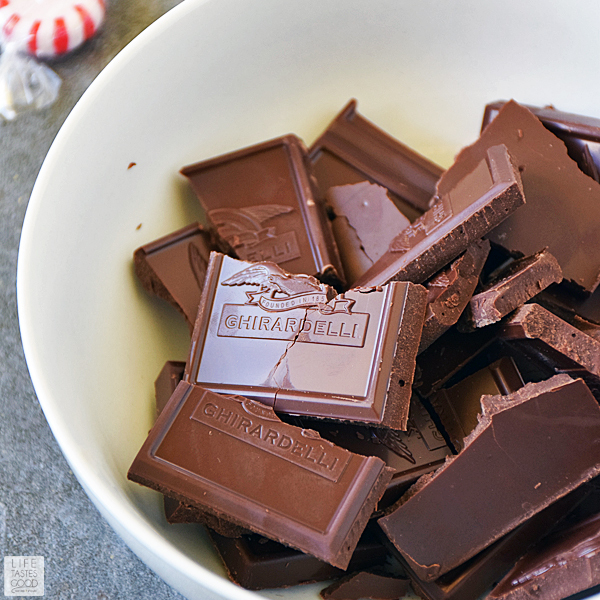 I use Ghirardelli Premium Baking Bars for both. I avoid chocolate chips for this recipe, especially white chocolate chips. 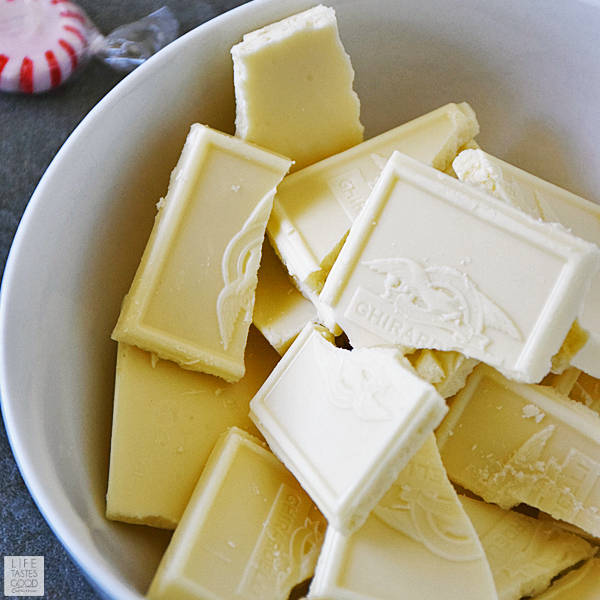 White chocolate chips are typically made with palm kernal oil or coconut oil instead of cocoa butter. You can melt the chocolates using a double broiler or in the microwave. Using the microwave works just fine, takes less time, and makes less of a mess, so that is the route I go. If you use the microwave be sure to follow my directions so you don't end up with a big hard ball of chocolate mess. Whatever you do, don't use chocolate you have leftover from last year! Is that even possible? I mean, chocolate doesn't last that long in my house, but if it sits around too long it will alter the recipe and might not melt properly, so buy fresh. 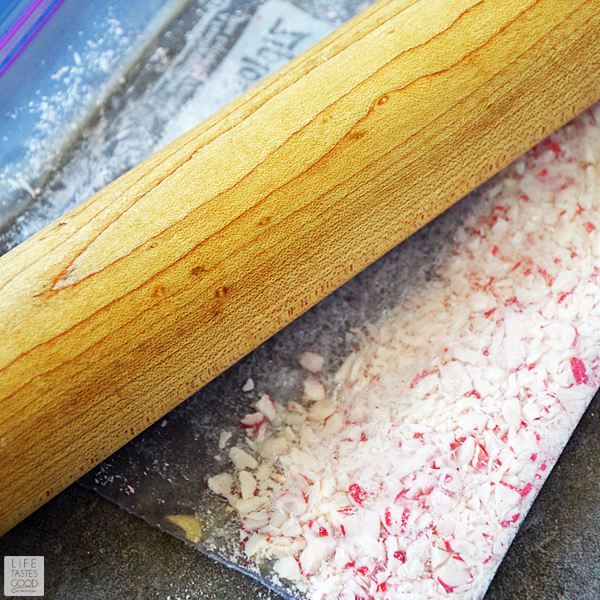 To crush up the peppermint candies I unwrap them and place them in a resealable plastic bag and then beat them with my rolling pin until they are very small. You can make the candies any size you like, but the smaller they are the easier it is to eat. Everyone will love receiving this thoughtful gift from your kitchen! Line an 8x8 square baking pan with parchment paper. Spray the bottom of the pan with cooking spray first to help the parchment paper stick and stay down. Be sure to use enough parchment so some hangs over the sides for easy handling. Break 6 ounces of semi-sweet baking chocolate into pieces and place in a microwave safe bowl. Microwave on 50% power for 1 minute. Stir and then microwave again, on 50% power, for 30 seconds and stir until smooth. Microwave again, on 50% power, for 30 seconds. Stir until smooth. Repeat the process as needed until the chocolate is smooth. Note: Microwave oven power varies, so you may need to keep microwaving for 30 second intervals until the chocolate is smooth. Be careful not to scorch the chocolate or it will seize up and never melt properly. 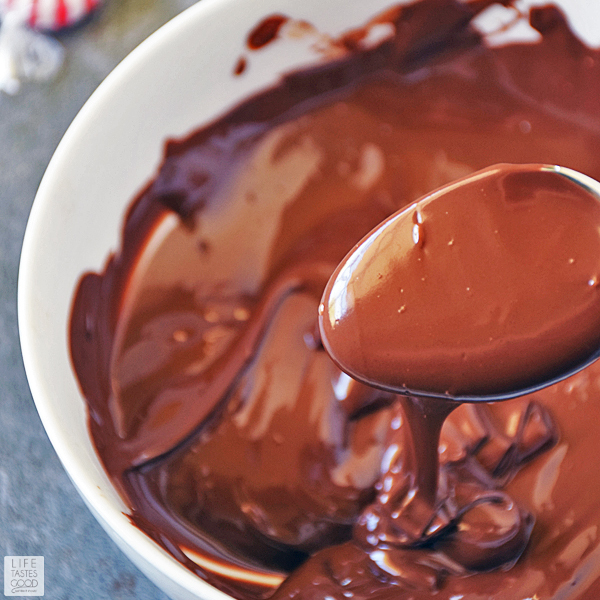 Pour the melted chocolate into the prepared pan and gently spread evenly across the bottom of the pan. 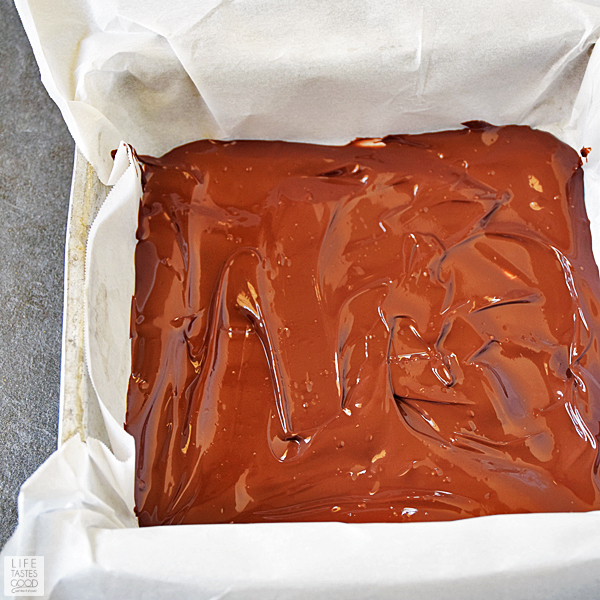 Allow to sit at room temperature for 20-30 minutes until the chocolate begins to set. The surface of the chocolate will begin to look dry and satiny, but it will still be a little soft. Once the semi-sweet chocolate is ready, break 6 ounces of white baking chocolate into pieces and place in a microwave safe bowl. 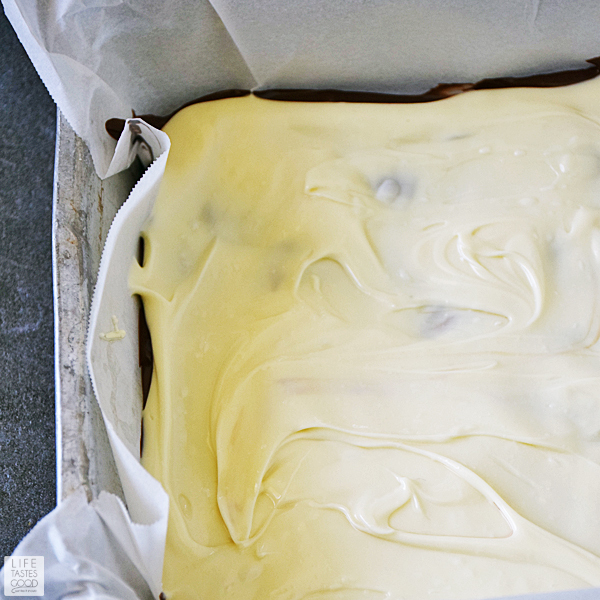 White chocolate is very sensitive, and melts much quicker, so we need to be more careful. Microwave on 50% power for 30 seconds. Stir and then microwave again, on 50% power, for 30 seconds and stir. Microwave again, on 50% power, for 30 seconds. Stir until smooth. Repeat the process as needed until the chocolate is smooth. Be very careful not to scorch the white chocolate or it will seize and never melt properly. Pour the white chocolate over the semi-sweet chocolate and carefully spread the white chocolate to cover the semi-sweet. Try not to mix the two chocolates. Sprinkle crushed mints over top of the white chocolate to cover and refrigerate until the chocolate hardens enough to cut into pieces. About 15-30 minutes. Cut into squares with a chef's knife and enjoy! NOTE: Times posted do not include resting time to allow the chocolate to harden in between layers and after adding the peppermints. Microwave on 50% power for 1 minute and stir. Microwave for 30 seconds at a time until smooth, being sure to stir after each heating. Be careful not to scorch the chocolate. When the chocolate is ready the surface will look dry and satiny. Microwave on 50% power for 30 seconds at a time until smooth, being sure to stir after each heating. Be careful not to scorch the chocolate. Pour white chocolate over semi-sweet cover and spread to cover, being careful not to mix the chocolates. To smash the peppermints to smithereens, I place 10 of them in a resealable plastic bag and use my rolling pin. A mallet or hammer will work too. Be careful not to smash your fingers or break your countertop! 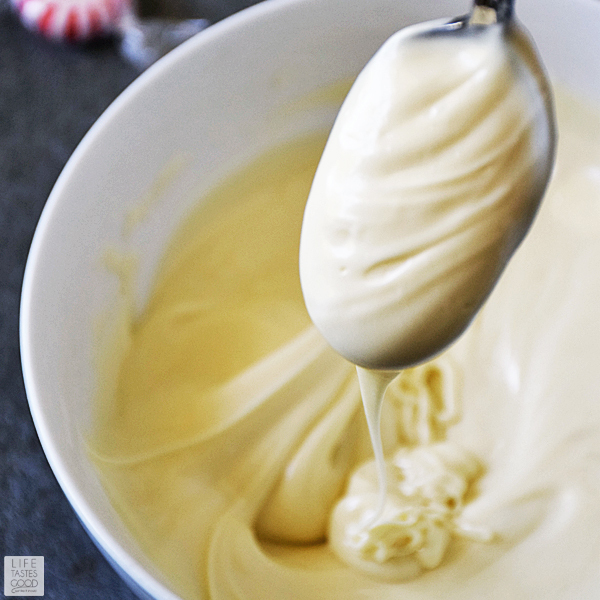 Sprinkle the crushed peppermints over top of the white chocolate and refrigerate until the chocolate is hardened. About 15-30 minutes. 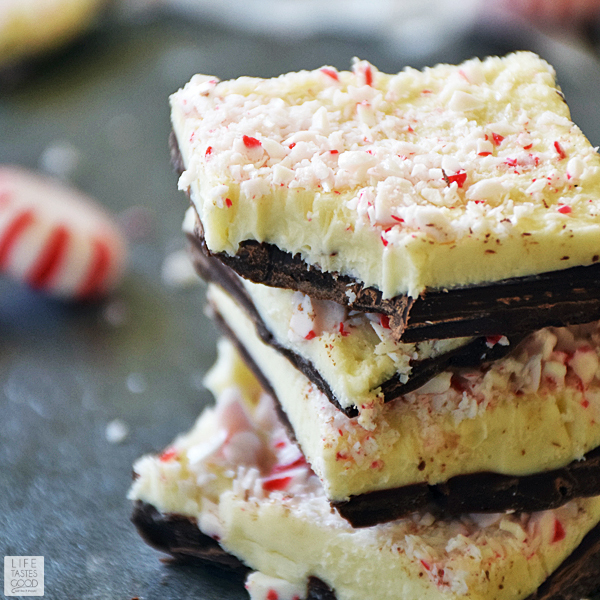 LOVE this double-decker peppermint bark!! My family will, too. 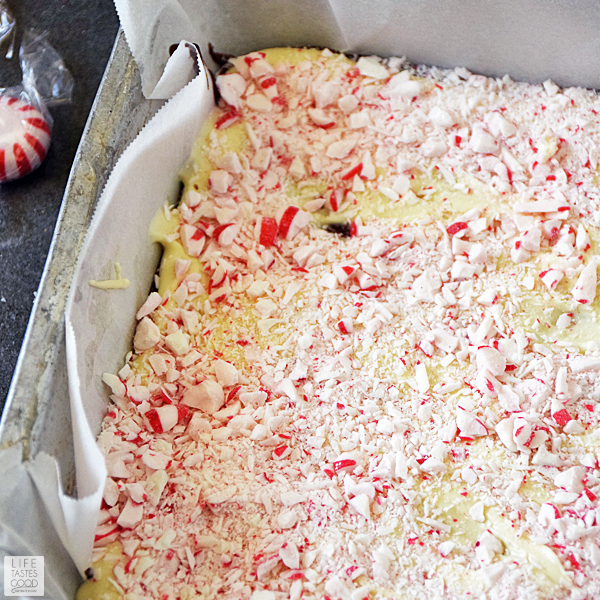 I make peppermint bark every year. You are absolutely right that it's all about using the best quality chocolate! I LOVE LOVE LOVE this recipe. 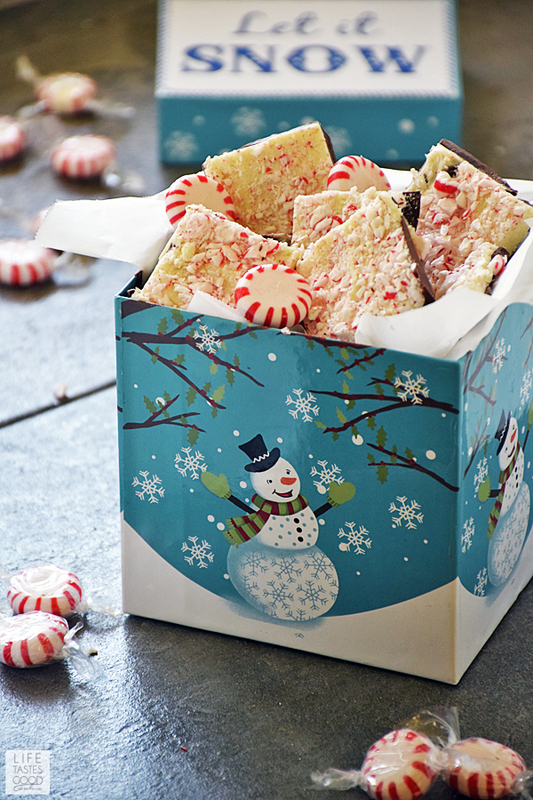 Peppermint Bark is always a family favorite. Great tips about the chocolate to buy!